Photo: Ecnec Chairperson and Prime Minister Sheikh Hasina presides over the meeting held at NEC conference room in Dhaka on Tuesday. Dhaka, Oct 23 : The Executive Committee of the National Economic Council (Ecnec) on Tuesday approved 21 projects involving an overall cost of some Tk 19,779 crore. Of the total estimated cost, Tk 17,316.93 crore will come from the national exchequer, while Tk 2,227.87 crore as project assistance and Tk 233.93 crore from the own funds of the organisations concerned, he said. In terms of the cost, the biggest three projects are ‘Collection of 35 Dredgers and Relevant Instruments including Auxiliary Water Vessels, and Construction of Necessary Infrastructure’ project involving Tk 4,489.03 crore; ‘Land Acquisition and Utility Transfer Project: Support to Improvement of Dhaka (Kanchpur)-Sylhet-Tamabil Highway into Four-lane and Construction of Separate Service Lanes on Both Sides’ project involving Tk 3,885.72 crore; and ‘2nd Urban Region Development’ project involving Tk 1,867 crore. Of the 21 approved projects, two are revised ones. 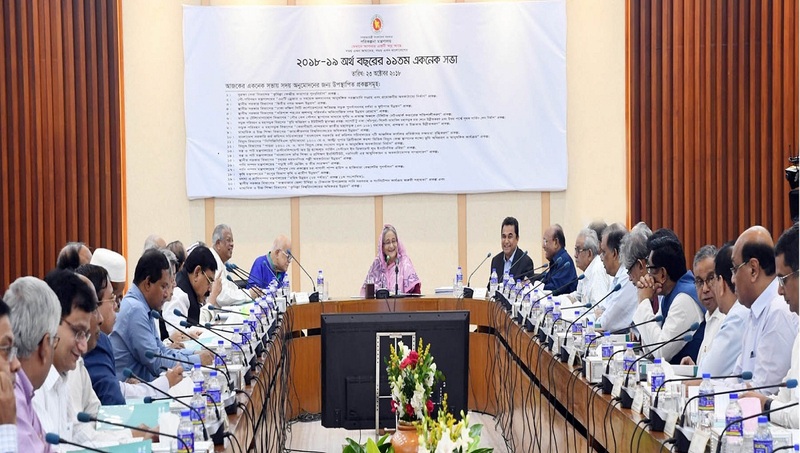 The revised projects are ‘Establishment of Three Handloom Services Centres in Different Loom Incentive Areas (2nd revised) Project involving Tk 88.80 crore and Greater Mymensingh Rural Infrastructural Development (2nd revised) Project involving Tk 1,867 crore.